Beautiful Sw Cape Coral Home. Large Pool, Lanai, Wifi, Ps3. Our home is conveniently located in a great residential neighborhood within short driving distance to Beaches, Pine island, Matlacha, Kayaking, Golf courses, Fishing, the Minnesota Twins and Boston Red Sox training camps, grocery stores, restaurants, unique shops and outlet malls. A walmart grocery is less then half a mile. The home is a 3 bedroom 2 bath. Newly remodeled kitchen and bathroom. Flatscreen tv's in the living room and master bedroom. A playstation 3 and games are located in the living room. 2 dvd players with family movies too. Walk through French doors to a very large oversized lanai. Great for relaxing or having drinks or dinner. Pool toys are included for your enjoyment. Kids and adults alike will love the heated pool. Enjoy the papaya, mango, and other exotic fruit trees in the back yard. 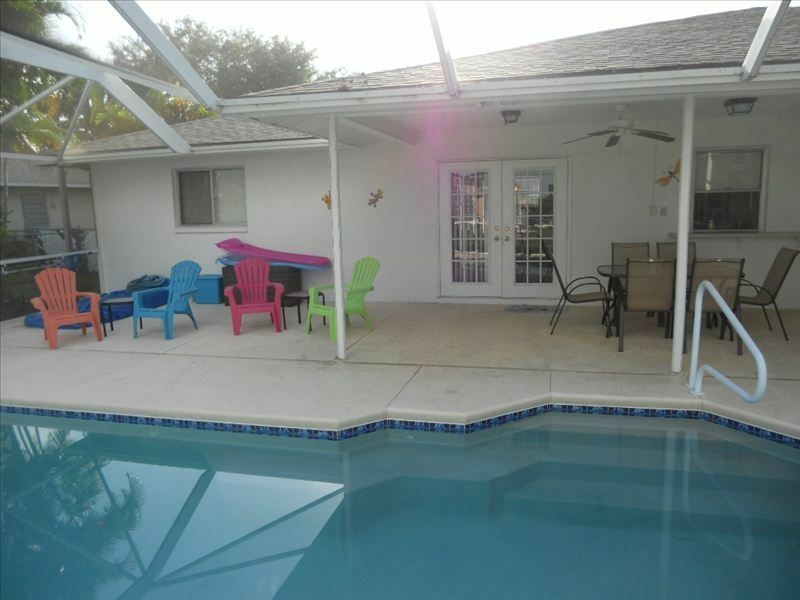 Keywords: Sleeps 8, pool, lanai, wifi, PS3, big screen tv's, near restaurants, ft myers beach nearby. Also included is a Playstation 3 with games. Family movies and dvd player in living room and master bedroom. We enjoyed our stay at your place. The furniture was comfortable and the beds were also comfortable. The bedroom fans could be replaced and installed with remotes. All of the appliances worked fine, and we would rent again. Marty, your manager, was super and responded timely about everything. We just returned from our stay and were very glad to see that the listing was true and accurate as to the property and the pictures we were sent. We had a wonderful time and was very impressed as to the cleanliness and up-keep on the vacation site. I would highly recommend this vacation home to anyone. We have already reserved the month of March for our vacation next year. It is a really good location, close to shopping and lots of good restaurants. Another perk is that the owners have a caretaker close by to answer any questions or to take care of any problems that may arise.